Windows Mobile device has becomes one of the most preferred handheld devices in today’s consumer market. It has friendly GUI with easy touch screen operation. However, it also has one common shortcoming – lack of hardware buttons that made it hard to be operated with single hand especially while driving on the road. If you also face the same problem like me but still would like to stick to Windows Mobile device, here is a potential software workaround that you could consider. 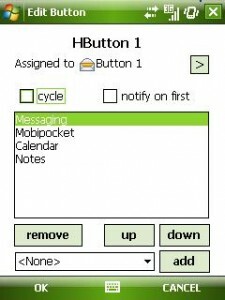 Named as HBUTTON, it is a free software utility that is able to expand the capability by emulating additional hard buttons program control without the need to modify any hardware settings in your existing mobile device. Similar to other software, just install the tiny CAB file (only consume less than 80kB of your mobile device memory space) and you are ready to go. User can choose to assign any hard button on the mobile device depending on own preference. For my case, since I am a left handed, I choose to program the Message button on the bottom right side of my o2 Zinc so that it is easier to operate. For the setup, it is a bit tricky for the start as user need to set the ‘delay in ms’ field correctly. Putting it too short or too long will not yield any pleasurable result and I ended up settled with 1500ms after multiple trials for the best performance. Now without the need to use both hands to control and view on the screen, user can just scroll through all the programmed lists with a single button control. Also there is a way to know if the program has been toggled successfully by programming a vibration or sounding alert when each program switches. If you choose not to trust your ears, you can still set it to display the right program toggling on the screen. Good thing is, the display characters’ size is programmable to fit your own preference. Also, there are seven buttons which are programmable to handle few tasks simultaneously. The software utility is compatible with Windows Mobile 2003, WM5 and WM6 and is free for download at Hundera now.